Can fire be used in a garden to cleanse the bed of disease or reduce it significantly? Phytophthora cinnamoni and Armillaria has contaminated the Protea Garden at Kirstenbosch and little work has been done to reduce the pathogen contamination. The project is focused on the reduction of the pathogens using fire. The un-burnt control bed will be compared with the fire treated beds. The same species are planted in each bed and the survival/mortality recorded. •	Trial or Experimental – Comparison the beds that are not burned and the one that bed by monitoring the new planted species if they can withstand the Armalleria and Phytophthora. •	To see what will germinate after the fire. Kirstenbosch has displayed Proteaceae in the same garden beds known as L section for many decades. It is a complex Family consisting of various genera some being easier to grow than others. The primary planting has focussed on ornamental species in the Genera Protea, Leucospermum and Leucadendron with a few hardy Serruria, Mimetes and Paranomus species also displayed. Whereas these plantings have graced Kirstenbosch for many years there is a noticeable and ever increasing problem with disease. These disease problems often result in up to or more than 50% mortality within a year of planting coupled with a noticeable increase in losses of mature large Proteas in their prime. Armillaria and Phytophthora have been identified as major concerns with the former being found on all diseased Proteas in the garden. In addition to this there are numerous other pathogens affecting Proteaceae including Anthracnose, blight, leaf-drop, leaf spots, scab, stem cankers diseases. The disease problem affecting the Proteaceae displays in the Kirstenbosch Garden has reached epidemic proportions with little or no effective treatments available. There is no known treatment for Armillaria. 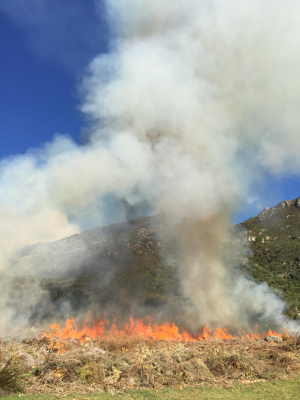 The re-planting of Proteaceae year after year in the same beds has contributed to the build-up of disease as there is no method of cleansing the vegetation as provided by fire in the natural environment. The addition of mulch in the form of wood chips is also a potential source of disease as this is raw chipped material recycled from the garden where diseased plants are growing. There is no sterilization of this material at the moment. Another source of disease is Phytophthora which is in the Kirstenbosch dam and regularly watered into the beds. 2. The bed is planted without being rotivated. The reseeder and resprouter species will be recorded including weeds, and exotic and alien plants.